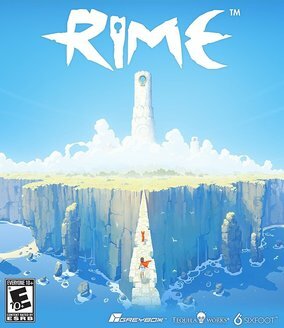 NEW YORK (CNS) — The video game “Rime” (Grey Box) starts simply, then builds up an emotional wallop. It’s no surprise there are YouTube videos featuring players weeping at the unexpected ending. That conclusion will not be revealed here for fear of a spoiler. But it concerns grief and the acceptance of loss. There is no graphic violence or sexual content in “Rime.” There are intense action sequences, though, as well as challenging themes dealing with death and emotional and spiritual suffering. “Rime” begins on a sunny and beautiful note, but gains intensity and darkness as gameplay progresses. A boy named Enu washes ashore on a beguiling island. The setting is gorgeous, with towering spires of majestic white staircases, lush yellow grass and Caribbean-blue water. However, a sense of anxiety builds as Enu encounters a fox, then a man in a red cape — figures that frequently appear and disappear. Guiding Enu, players complete a series of tasks and puzzles, such as avoiding enemies and collecting light that beams from several sources. The environment eventually becomes rainy, then stormy. Enu’s footing grows less steady. Online gamers have speculated that the stages of the game, which lasts about 10 hours, mirror the stages of grief: denial, anger, bargaining, depression and acceptance. Is Enu actually dead and passing into heaven? Or is he perhaps a projection in the mind of someone else, maybe a loved one? The answers are best left to gamers to discover and interpret for themselves. The puzzles in “Rime” are clever and only occasionally frustrating. Enu uses his voice to shatter orbs of light and defeat shadow beasts, uses fruit to distract boars so he can gain safe passage, and moves cranks to create thunderstorms to confront different antagonists. Yet “Rime” could work even without puzzles, since it’s the emotional aspect of the game that delivers the biggest payoff. In a 2014 interview with Polygon.com, Raul Rubio Munarriz, the creative director of “Rime,” explained how the idea for the game came to him in rather unusual circumstances: He was close to drowning in the Mediterranean Sea. Munarriz had swum out to a buoy, only to be seized by a panic attack. He was saved by his brother-in-law. Available on PlayStation 4, Xbox One, Nintendo Switch and Microsoft Windows. The game contains stylized violence and mature themes. The Catholic News Service classification is A-II — adults and adolescents. The Entertainment Software Rating Board rating is E-10+ — for those 10 and older.